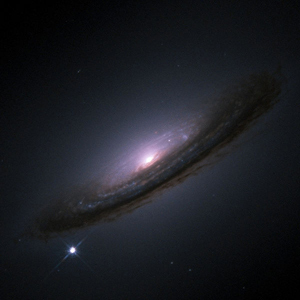 In the late 1990s astronomers from the Supernova Cosmology Project (University of California Berkeley) and the High-z Supernova Search Team (Australian National University and John Hopkins University) were studying type Ia supernovas to accurately determine the rate of decline of the universe's expansion. Both teams initially used land-based telescopes for preliminary data. After locating Ia supernovas using the Keck Telescope in Hawaii (designed by Berkeley) and other telescopes where time could be scrounged, both teams finally obtained time in 1998 on the Hubble Telescope (shown at the left) to study the most distant supernovas. They required much more accurate measurements than could be obtained from their ground-based telescopes. 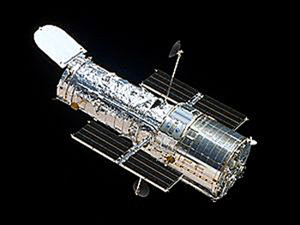 The teams discovered that far from decelerating under the influence of gravity (as was commonly thought), Hubble confirmed that not only was the universe continuing to expand, but that the expansion was accelerating. Type Ia Supernovas, the bright spot at the lower left of the galaxy in the picture at the left, are very rare. In a typical galaxy they may occur only two or three times in a thousand years. Type Ia supernovas occur when a white dwarf, an aging star about the size of the earth but with about the same mass as the sun, accumulates too much matter from a companion star or a gas/dust cloud. In that bulging stage, intense gravitational pressure triggers a runaway thermo-nuclear explosion. Since all Type Ia supernovas have about the same mass at the time of explosion, they all give off about the same amount of light. Therefore Ia supernovas are extremely "unique" because they all have the same maximum brightness at their peak after they explode (allowing for a duration calibration). Type Ia supernovas that exploded when the universe was half its present age behave the same as current ones do today. So the "peak brightness" can be used as a "standard candle". Type Ia supernovas are superb candles - explosions so bright that for a few days they can be brighter than entire galaxies. Therefore how bright they appear reveals their distance. A far away supernova can be compared to closer supernovas (whose distance is known by other means) resulting in a very good estimate of the far supernova's distance. Also, we know that the speed of light "c", divided by the distance "d", equals their relative age. 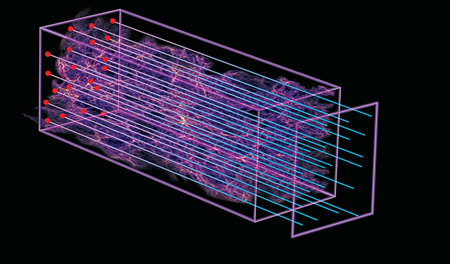 Using the calibration techniques developed by Saul Perlmutter, if a supernova has a redshift that is dimmer than expected, that supernova must be farther away than thought. Its light has taken longer to reach us, and so the universe must have taken longer to grow to its current size. Therefore, the expansion rate of the universe must have been slower in the past than expected. The supernova photo at the left is one of the actual photos studied by the Berkeley team. In fact, the distant supernovas are dim enough that the expansion of the universe must have accelerated to have caught up with its current expansion rate. Instead of slowing down as everyone had expected, the dimness of the supernovas showed that they were 10% to 15% farther out than anticipated, indicating that expansion had accelerated over the ensuing billions of years. In January 1998, the Supernova Cosmology Project presented the first evidence that the expansion was accelerating and that the acceleration was due to a positive Einstein Cosmological Constant, known by the Greek letter "lambda". 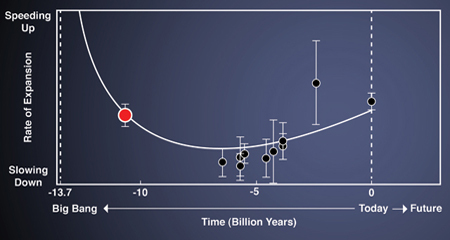 Subsequently, the High-z Supernova Search Team independently announced that they had come up with the same results. Gravitational Lensing. The first of Einstein's gravity predictions was the bending of light as it passes near a massive body. See the chart at the left. During the solar eclipse of 1919 when the sun was in front of the Hyades star cluster, English Astronomer Sir Arthur Eddington stationed himself on an island off the western coast of Africa and sent another group of British scientists to Brazil. Measurements of several of the stars in the cluster showed that the light from these stars was indeed bent by the exact amount of Einstein's equations as it passed close by the sun. The bending of light results from the warping of space in the vicinity of a massive object (like the sun). The light never changes course, but merely follows the curvature of bent space. 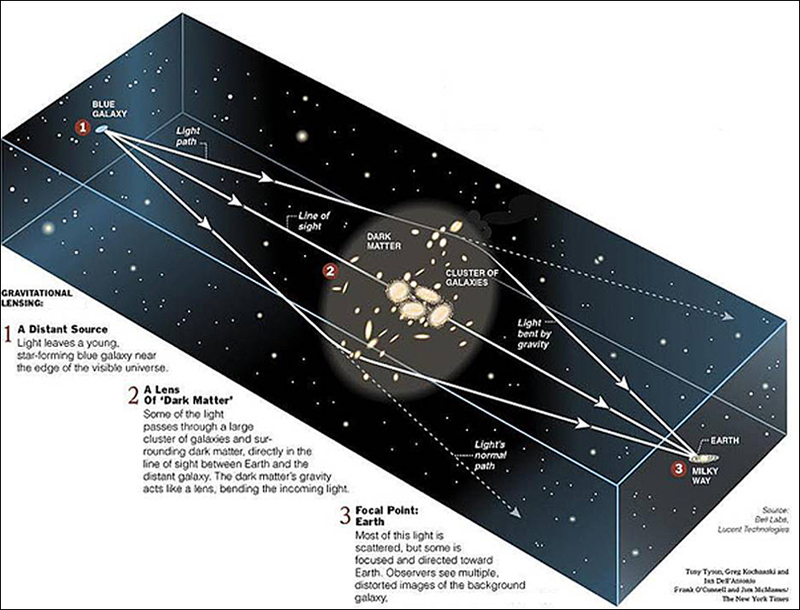 Large bodies of matter cause light traveling around them to bend which is called Gravitational Lensing. Gravitational Lensing As A Tool. Modern astronomers have learned to use gravitational lensing as a tool. 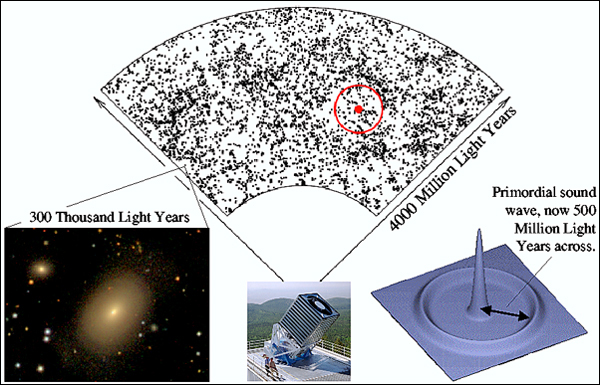 The gravitational lensing effect can magnify an object just like a magnifying glass does. Also, gravitational lenses act equally on all kinds of electromagnetic radiation, not just visible light. When the lensing mass is a galaxy (as opposed to a single star), the original source may be scattered around the lens or multiple images of the same source may appear. The number and shape of these images depends upon the relative positions of the source, the lens, and the observer plus the shape and size of the lensing body. The original source may be 10 to 20 times further away than the lensing object which allows the observer to see much further (and earlier) than one normally could, especially when using the Hubble space telescope. Cosmologist are now using this technique to "see" objects that are many billions of light years away and are from the early universe. The photo to the left is an example. 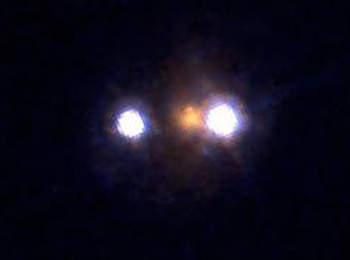 The orange galaxy in the center is the acting lens. The two white images are from one very distant quasar. The methodologies for determining accelerated expansion of the universe based on Ia supernovas are built on several assumptions. Therefore an independent check of the results is important to solidify the finding. Quasars are powered by gigantic black holes that gobble up huge amounts of matter in the centers of galaxies releasing very powerful jets of light that shoot out into space. See the artists conception of a quasar at the left. Also see the Quasar Section. themes: 1) dark energy and cosmological parameters; 2) the structure, dynamics, and chemical evolution of the Milky Way; and 3) the architecture of planetary systems. 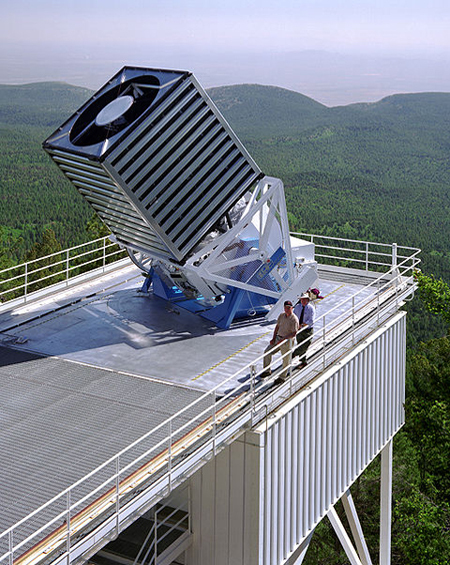 Shown at the left is the 2.5 meter telescope at Apache Point Observatory (APO) in New Mexico primarily for the use of the SDSS team. The project is in its third phase (2008 to 2014) and is expected to finish its surveys by the summer of 2014. Previous phases were the original SDSS-I project from 2000 to 2005 and then an extension of the first phase from 2005 to 2008 called SDSS-II. The telescope is equipped with two powerful special purpose instruments - a digital camera and a spectroscope. The first picture of an object is an optical one which takes about one minute. The camera is then replaced by a spectrograph apparatus which takes 5 shots at 5 different frequencies which takes about 6 minutes, then on to the next camera shot setup. The 120-megapixel camera images 1.5 square degrees of sky at a time (about eight times the area of a full moon). The spectroscope consists of a pair of spectrographs fed by pre-positioned optical fibers on a plate that record the optical spectra revealing the distances of up to 1000 galaxies and quasars in a single observation. Each night between six and nine setups record data from 6,000 to 9,000 celestial objects which produce over 200 gigabytes of data. Light is focused by the telescopic lens through five filters, one at a time, that separate the beam into a frequency spectrum on digital charge coupled devices ( CCDs). Charles Kao, Willard Boyle, and George Smith were awarded the Nobel Prize in Physics in 2009 for their invention of the fiber optics and CCDs used in the APO spectroscope. The system is fully automated and controlled by a complex computer system that also records the massive amounts of data in real time. The intensity of light at different frequencies in the spectrum can be analyzed to determine the source of the light, its chemical composition and various parameters, such as whether it seems point like or extended as a galaxy might appear. The images are recorded to produce data sets of the many hundreds of thousands of objects and their characteristics that are observed . The SDSS telescope is relatively fixed in its position and makes use of the earth's rotation to record strips of the night sky. The spectroscope was designed with an unusually large 3º field of view to support its goal of surveying a very large portion of the observable universe. The Baryon Oscillation Spectroscopic Survey (BOSS) is one of four surveys that make up the SDSS-III Project. It utilizes a technique pioneered by the original SDSS team in 2005 called "Baryon Acoustic Oscillations (BAO)." That team was led by Daniel Eisenstein, Professor of Astronomy at the University of Arizona (now at Harvard). The BAO technique uses hydrogen gas clouds left over from the early universe as a "standard ruler" to compare the size of the universe at various points in time and can also be seen in the Cosmic Microwave Background (CMB). BAO patterns were originally recognized by Peebles and Yu in 1970. It is believed that plasma expansion pressures versus gravity forces in the first moments after the Big Bang caused density perturbations (waves) through the early plasma that oscillated like sound waves through air. At the end of about 400,000 years these waves had morphed into a resonant frequency and size. As a result, spherical waves of a very unique size were driven into the surrounding medium. 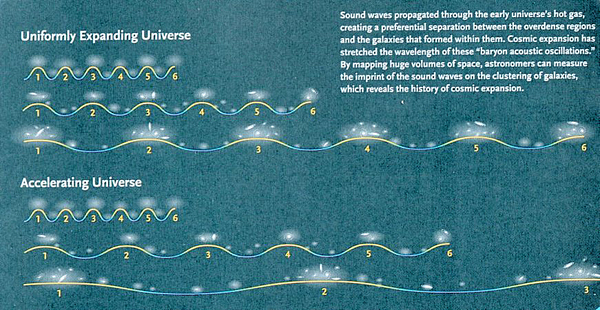 After a million years the universe had cooled sufficiently that these waves had solidified into formations that "today" are 500 million light years across. Also as a result, early galaxies had a tendency to form at the "peaks" of these waves. See the illustration to the left and note that the galaxies (white areas) are spread out and heaviest on the peaks of the cycles. The original SDSS team was able to statistically detect these signatures in galaxies across the universe. These imprints left over from the early universe can now be used as "standard rulers" to measure distances from the earth to distant objects. However, if galaxies were used as sources of light, it would be very difficult because galaxies that are far away are also very faint making it hard to use their faint light as a source. The other negative to using BAOs as "standard rulers" is that their scale is incredibly large. Because the technique requires statistical measurements involving many thousands of data points at huge distances (500 million light years apart), it has not been practical until the BOSS survey (with a significant SDSS-III optical hardware upgrade) to undertake such a massive project. The new measurement technique makes use of the clouds of intergalactic hydrogen gas in the universe. This gas can be "seen" because it absorbs some of the light from distant quasars lying behind the gas. (Quasars are the brightest objects in the universe.) 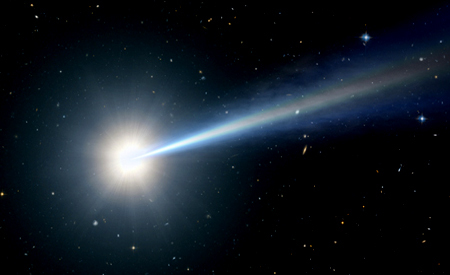 When the spectrum of a quasar is analyzed, we see not only the light emitted by the quasar but also what happened to that light during its long journey to earth. When we inspect a quasar's spectrum, we can see how the intervening gas had absorbed some of the quasar's light. Measuring the absorption patterns yields a detailed picture of gas variations between the quasar and the earth. The picture to the left illustrates how quasars are used to probe the distribution of hydrogen gases (purple figures) along the line of sight from each red dot on the upper left (a quasar) to the APO 2.5 meter telescope on earth (represented by the plane in the lower right). The James Webb Space Telescope, JWST or The Webb, will replace the Hubble with a 2019 launch date if the program remains on schedule. It is named after the second NASA chief administrator, James Webb. James Webb was responsible for sending the first men to the moon in 1969, but he had a much larger vision for NASA. He envisioned NASA as the agency of the US Government that would do fundamental research of deep space in addition to providing space travel. He basically envisioned NASA as it is today. The Webb is a collaboration between NASA, the European Space Agency (ESA) and the Canadian Space Agency (CSA). 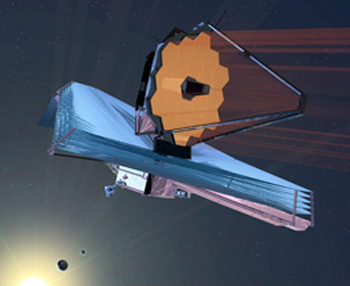 In July 2008 NASA confirmed that the Webb project was to proceed into its implementation phase. The Webb project conducted a major mission review in March 2010 and is now proceeding with implementation.